The first cherry tomatoes of the season are worth a mention but are hardly worth a ritual to welcome them. These were hiding almost down at ground level but were given away by the light of the evening sun. 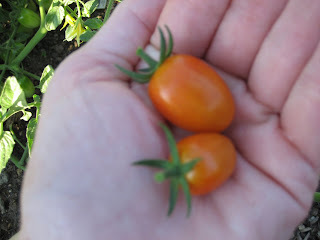 I wish I could tell you what variety this is, but unfortunately, I've lost track of what varieties of cherry tomatoes I have. Earlier in the spring, I planted the variety I grew from seed, 'Jelly Bean Grape' and guess who promptly bit off three of the four plants? If you guessed Mr. Rabbit, award yourself something, because that is correct. He left one plant, so I went to the store and bought some Sweet 100's and a yellow variety, I think, to replace the others. I'm not for sure on those varieties, so don't quote me. And I'm not sure which variety I harvested this evening because I didn't clearly mark which plant was which. I know, that was lazy of me. My only excuse is I was so distraught over the rabbit eating my tomato plants that I wasn't thinking clearly when I replanted with new plants. We can rule out the yellow variety, after that your guess is as good as mine. Without much ceremony, I ate these two promptly. 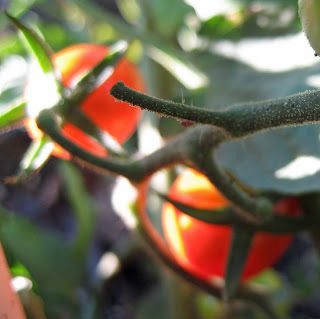 In a few weeks when I harvest my first big red tomato, then we'll have a ceremony of the first tomato! I absolutely love your ritual for the first ripe tomato. That seems so appropriate. I saved our first ripe one for our 9-year-old grandson to pick. He is our little gardener-in-training. We had this first ripe one ceremoniously for lunch, making sure everyone had a taste. Those pesky wabbits! Last year, overnight, they ate our okra stalks down to the ground. This year, we dusted with some kind of gunk, and it apparently worked. Also, there was a row of broad leaf mustard nearby, so that probably saved the okra this time. I feel sorry for the little critters if they are hungry, but hey! I've waited all winter for these things. Go eat some weeds or something. Well at least you have a few all be it small tomatoes to tide you over till that big juicy tomato. I love the 'ritual'. That sure taught me how to fully enjoy every sweet happening in life. I have listed you as a blogger bringing about a positive change in an internet meme game. You have always been an inspiration.Please find time to see the details on my blog. Wabbits do not seem to like weeds. They like swiss chard, tomatoes, and Balloon Flowers to mention a few things. They did not bother my lettuce this year though - which would have been the deal breaker as the deer at the sunflowers. I love the RITUAL. I celebrate something each day as a rule of life.